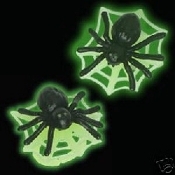 Huge SPIDER and WEB BUTTON EARRINGS - Halloween Glow in the Dark Costume Jewelry - Gothic, Wicca, Punk, Witch SPIDER with WEB (GLOWS WHEN EXPOSED TO BRIGHT LIGHT. NO BATTERIES NEEDED) Dimensional plastic Post Charm, approx. 1-3/8-inch diameter.